Piezoelectric Transformers are a Thing, Have You Used One? Cheap piezo buzzers are everywhere. They’re so cheap that they can be used in novelty birthday cards. Applying an alternating voltage across a piezo crystal makes it expand and contract, and fixing this crystal to a metal disk gives the piezo speaker its characteristic tinny sound that is anything but pleasant. The piezoelectric effect works the other way too, and piezo elements are very useful as vibration sensors. Simply put one of your voltmeter leads on each of the piezo element’s wires and touch the element with your hand or knock it against your bench. You should see a voltage spike on your voltmeter which will change in magnitude with the amount of force you use when touching the element. 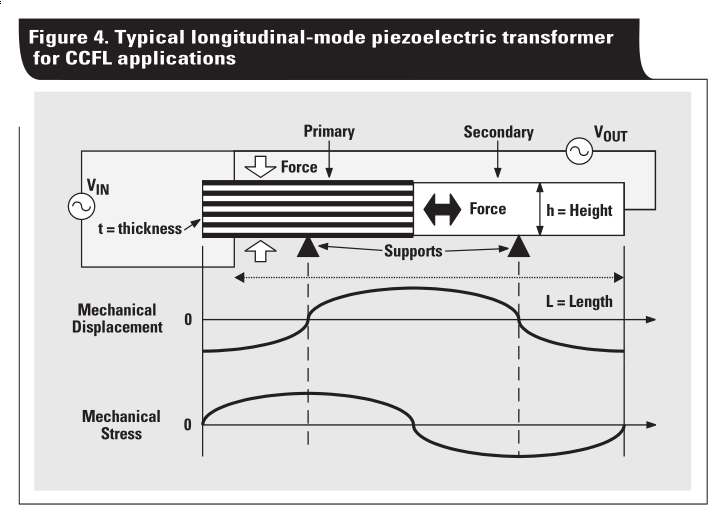 This ability to change shape when a voltage is applied and to create a voltage when they’re deformed is the basis of the piezoelectric transformer (PZT). While searching for a high voltage/low current transformer, Hackaday reader [Josh] was surprised to find a piezoelectric solution. He didn’t say whether he decided to use a PZT in his project but he did link us to a decent PDF on the subject. In a PZT, two piezo elements sit next to each other. The primary is made up of multiple thin layers that expand horizontally and press on a single secondary piezo element. The more and the thinner the primary layers, the more force is exerted on the secondary, and the more voltage it develops. There are a few equations involved which you can check out in the PDF linked above that go over this concept in painful detail if you’re into that sort of thing. If you have never played with piezo element you should add one to your next parts order. They are cheap and easy to experiment with. We have seen piezo elements used in DIY speakers, sonar projects, and even as the sensor for an atomic force microscope, but we have yet to see a piezoelectric transformer in a hack. Surely someone has used one in a project they worked on, leave us a link in the comments if you’re the person we’re talking about. About 8 years ago, I hacked together a portable digital TV out of a DTV converter box and the LCD off an old portable DVD player. The LCD just happened to use a piezo transformer for the backlight. I used 2 piezo’s in an arrangement to send power wirelessly to an LED years back, I had one set up as a transmitter and the other as the receiver. It was partly successful. I used a small charge pump and a supercap. Initially the project was going to be used in a BEAM racer as an alternative to a solar panel but could not get the range. PTZ is usually not in reference to the fact that it is being used as a transformer, but a reference to the piezo material itself. In the case you referenced, it would be lead zirconate titanate. Maybe RoHS and other lead free regulations are why those things never caught on? No, the lead is part of a molecule and will not separate out short of a chemical reaction. My guess the reason they did not catch on is they appeared when LED backlights started to hit their stride and are CCFLs no longer needed. Triggers for a simple arduino electronic drum. Reads audio off an SD card and plays it directly to a speaker when the piezo voltage hits a minimum voltage. There’s a ton of people building really legit diy kits as well. that would be acting as a transducer, not a transformer. I’ve been looking into plasma generators for my project. It turns out that piezo transformers are well suited to that application – they are low current, so no current limiting resistors are needed, and galvanically isolated from the circuitry of the primary. Unlike regular transformers which have low primary impedance, piezo transformers have high primary impedance, making it easier to regulate current and power. Anyone know where to get some? some parts are made specifically for the application or whenever a new technology comes out device makers use the specific parts first as a way to test if the technology will hold up for the long run i.e. if the pzt failed in that dvd player and the backlight died then the death of the new technology or the “back to the drawing board effect” is limited to a few devices instead of millions. although to think about it the piezo speaker element used in modern smoke and co alarms and telephones may act as a pzt. DigiKey used to stock them… I recall buying a few about 7 years ago. I never used them in a project. Ummm… sell some to me? I wonder if these would function well as the step-up transformer in small electrostatic speakers. Too narrow of a bandwidth, unless you’re using one for the bias supply in which case it would work great. How would that work for a nixie tube power supply? Anybody care to comment? It would work, but you’d have to adjust the circuit a little. The transformers in the link shown above have a 50:1 ratio. Using 12 volts input would give 600 volts output, and Nixies use in the neighborhood of 170 volts, so you’d have to drop the voltage a little. You’d also need to rectify the output, which means you would use smoothing capacitors… which you would need for just about any other circuit as well. You could pulse the transformer with a duty cycle less than 50% to get the lower voltage. The transformer power output is a few watts (depending on type), which is good enough for nixies. You’ll still need to build the high-voltage generator circuit using the piezo transformer. It’s about as complicated as a regular transformer solution, so it’s not clear there’s anything to be gained, other than exploring the different technology. I’m just guessing, but I’d imagine these don’t function like a normal magnetic transformer, where voltage out = voltage in x turns ratio. Seems like piezo transformers are intended for a specific input and output voltage, and changing the input voltage wouldn’t affect the output voltage much. Certainly not linearly, and I’d guess you’d instead lose power or current, rather then just getting a proportionally lower voltage. Too high an input voltage I bet would damage the piezo. This is just a guess, based on how they work, and what they’re used for. I’d be interested to know if I’m right, or if I’m wrong. Years ago I used a $1 Radio Shack piezo as a pickup for an old acoustic guitar. The element was mounted (taped) to the inside, under the bridge. The 1/4″ jack was a few bucks, and for less than $10 and a lazy afternoon’s work, I could amplify my guitar without any external adapters or wires hanging out. Granted, you need to play with the EQ a bit to get a balanced sound, but the end result is very playable, and at a fraction of the cost of a premade solution. Put that disc under the bridge with the downbearing strings on it and you will get much more signal without that tinny sound. The disc has to be loaded with a portion of weight so it operates in the linear range to get a full range “sine wave” not a pulsing of signal. So much signal in fact that it will drive headphones and be audible in a speaker, no battery or amp! echodelta – do you mean as in sandwiched between the guitar body and bridge? That sounds pretty involved, unless I’m misunderstanding. I did run across some piezo strips which get installed under the saddle. Those would definitely be under load, and the mod looks pretty straightforward. I might have to look into that when I get a free weekend. Google Ibanez piezo pickup or Ibanez piezo bridge. They came out with those in the 1990’s. Galene – I eventually ended up on amazon (amazing how often that happens…), and found too many options to even list… and incredibly inexpensive. Unless I had the parts already in a junk box, I don’t think it’d be worth my time to make another one myself. At the time I made mine, ebay and amazon were small startups, and music stores wanted ~$100 for a setup, which was definitely outside my budget. Bought some from ebay, in backlight inverters, with the intention of making a plasma pen, the piezo can go inside the pen making a neat unit, just started the project this weekend so early days, but perfect timing for this article. Unimpressed by lack of burnt finger. Especially since I was excited looking forward to seeing it cut through stuff. So what would you use a plasma pen for? Could you at least light a cigarette? Or I suppose ignite the gas in a cigarette lighter? Do they have a legitimate use? Also seemed a bit showing-off, doing finite element analysis of a component bought off the shelf. It didn’t tell him anything useful, and we already know that the thing vibrates to produce high voltage. I’m starting to think it’s a lot of sound and fury, signifying nothing, except no sound and not much fury. It looks like cold(nonthermal) plasma, which means that while it can’t burn anything it’s got amazing antimicrobial properties. I use a variation on this concept to power my house. I have built several thousand piezo-transformer cells. Each is a piezo sandwich, there is a primary strip in the middle between to secondary strips. I forget how many of these it took but i have them grouped into 100 ‘sandwich’ long series connected strings with a whole lot of these strings connected in parallel. Together they are enough to keep my inverter running all day. The real genius part, if I do say so myself is that I am only tapping power from one of the secondaries in each sandwhich. Power from the other is simply looped back into the primary to keep the whole thing going. After constructing a string I used to start each going by momentarily applying a 9-volt battery to the primary. Several hundred sandwiches in I had depleted my original 9v and that was when I realized the battery was uneccesary. Since mechanical disturbance generated electricity all I really had to do was yell at it. I lit up every sandwich in a whole string the first time I tried that. I got a nasty shock! Now I don’t manually activate my strings any more. I found an even better way to do it. I just take them up to my attic where they are to be installed. In the attic I have a stereo playing 24×7. This automatically activates my new strings as I bring them up. Further, the added vibrations from keeping the music going seems to increase the efficiency of my existing piezo power source by about 6%. This took some experimentation to arrive at of course. I started by playing Queen’s Bohemian Rapsody. That only gave me a 2% increase. I have seen as high as 8% using MC Hammer’s music but that was a bit much. My piezo sandwiches started heating up. I couldn’t even touch them! Finally I settled on an old Rick Aston 8-track which seems to get just the right amount of performance out of my Piezo stacks without heating them up too much. The 8-track is perfect for this btw because it can run continuously in a loop. My piezo sandwich power stack has sure served me well. I haven’t had to pay an electric bill in 3 years now! Why isn’t everyone doing this? I’m never giving this thing up! That sounds a lot like free energy BS. That’s nearly as good as the one where they install piezos under roads and pavements and convert the vibration into electric power. Saw these in CPC back in the day, the problem is that they are going EOL now as CCFLs are virtually extinct. Also relevant: building E-bike charger with used ones. They do degrade but not much and lifetime is related to load. I think I’ve only ever seen maybe two blown units ever and both were due to mechanical damage. I am sorry, that it is in czech language. It is my thesis on piezoelectric transformers and how to build one with already meassured properties. Also valuable data. They do *NOT* like heat nor excessive voltage. The actual failure mode can be reversed as what you do is run it under oil and re-pole it. This is incidentally how they are formed in the first place! Also don’t overheat the interconnects as they are fragile silver plating like piezo speakers. I came up with a design for a piezoelectric driven VTOL craft, the problem is getting enough of them. CPC used to do them but if you know who to ask larger multi-output inverters are available which can be made so that each module is galvanically isolated and independently driven by the host microcontroller.